Designed to meet the USP-790 spec Two standard models; ErgoVu-50 and ErgoVu-50C compact footprint version. Dual LED topside illuminators offer >15K Lux output at inspection surface. Customizable sizes to your specification. 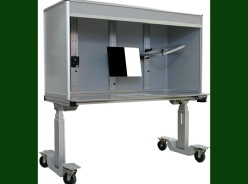 Nyoptics has designed and built a wide range of ergonomically designed manual inspection booths for pharmaceutical visual inspection and work tables for general tasks. We have been manufacturing our custom designed, Made in USA inspection stations since 2005. They are in use at major pharmaceutical and biomedical companies world-wide and have a proven extremely high reliability record. 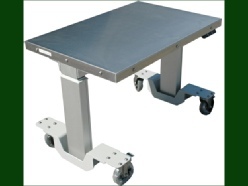 The inspection systems and tables provide optional motorized adjustable height table surfaces with radiused front edges for operator comfort and efficiency. The motorized motion is quiet and smooth, allowing operators to find the correct working position to eliminate fatigue. All systems are designed and built in the USA using only the finest materials for a long operational life. We can provide an ergonomic specialist that can work with your company to provide the best solutions for the operator tasks and reduce or eliminate expensive workman comp claims. We offer many optional accessories to complete the package, from LED custom lighting to microscope and optical systems for inspection, rework, and micro-assembly tasks. We can also custom build stations to fit your needs. Designed for maximum ergonomic product inspection. Table surface motorized for heights of 25” - 52”. Clean room designed using finest quality components. Options of top/bottom, bottom only, top only LED illumination. Long life, low energy design. 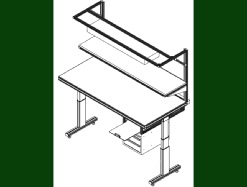 We can design and build work stations to improve operator ergonomics and efficiency. Motorized lift options, illumination systems, tool holders with a wide range of surface and framing materials suitable for production areas and cleanroom use. 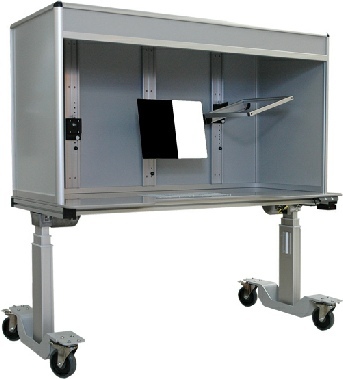 Our inspection booths can be configured with UV spectrum LEDs for inspection of PC board conformal coatings. 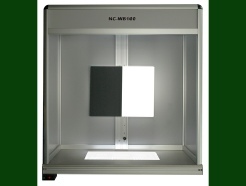 Magnifier optics can be mounted as well as white light LEDs and cameras for a complete inspection solution. 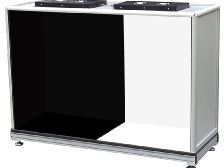 Designed to be companion products to the inspection booth offering identical lift range 25”-52”. Precision locking, smooth rolling casters. Solid build of aluminum and stainless steel. Customize sizes to your specification.